Stay with Even reindeer herders in the Kamchatka backcountry. Visit the basecamp of an active Volcano. 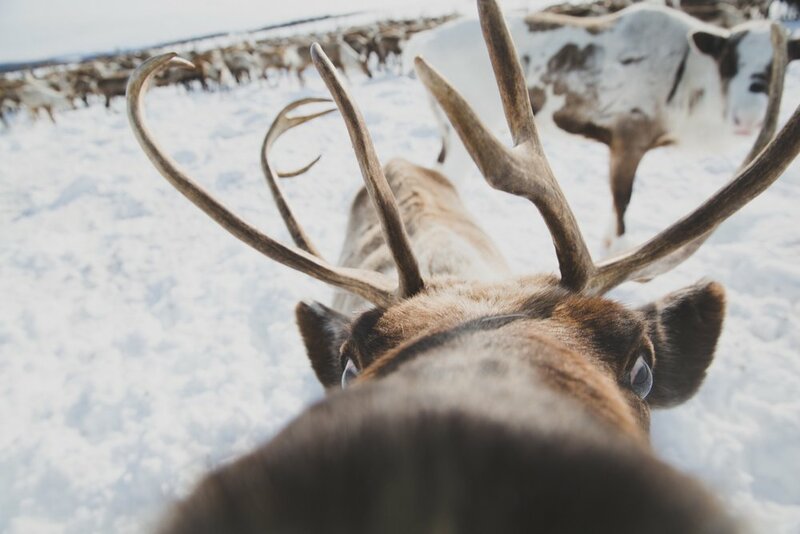 Approach herds of reindeer and build trust with the animals. Bond with a group of adventurers ready for the unknown. Explore the untouched boreal forests of the Kamchatka Peninsula. Hang out with our Russian team made up of local ethnic Russians, Iltemens, Koryaks and Evens. Bathe in natural thermal hot springs surrounded by nature. Drink vodka like a local. Climb to the top of Mishennoy Hill for an excellent sunset view over the city of Petropavlovsk-Kamchatsky and towering volcanos. Arrivals in Petropavlovsk-Kamchatsky (PK for short) throughout the day. We will host a welcome dinner in the evening at the Hotel Petropavlovsk. Their borscht is incredible. Today we will gather supplies and prepare to set off for the wild lands of central Kamchatka. We will visit the central market in Petropavlovsk for people to stock up on last minute gear and supplies from Russian army navy supply stores as well as purchase snacks and food items. We will climb up to the top of Mishennoy Hill for an excellent sunset view over the city and towering volcanos in the evening before enjoying a traditional Russian dinner in the city. We will depart from Petropavlovsk in the morning by public bus to Milkovo. Depending on the road conditions, this drive can take anywhere from 3 to 5 hours, but in general the conditions are good and the drivers are experienced. Once we arrive, we will have a Russian canteen style lunch (very Soviet). There, we will meet Vladimir and Roman, our Russian team leaders, and travel with them to the Park Inspectors Camp at Ketachan. We will spend the night here bonding with the Russian team and preparing ourselves for our backcountry adventure. Over the next four days we venture into the deep, mountainous backcountry of central Kamchatka. Starting from Ketachan Inspectors Camp, we will travel to Dalny Camp and then to the base of Ichinsky Volcano and a remote Even reindeer herder settlement in Ichinsky, called a taboon. From there ,we will continue to Dimshikan Inspectors Camp and then over the mountain pass to Esso village in the middle of Kamchatka. Today we will restock our supplies and rejuvenate our souls in Esso’s natural hot springs. After four days in the backcountry, a shower, soft bed, some modern comforts, and a warm home will feel wonderful. During the day we will explore the quaint town of Esso with its wooden cabin style homes and a museum dedicated to the nature and wildlife of Kamchatka as well as the peninsula's native people. We will buy enough food to last us throughout the second half of our expedition, including lots of grains, canned foods and easy to pack vegetables. Once we reach the herders, we can barter for reindeer meat. We will spend the evening in warm beds at a couple local homestay B&Bs. We will spend the next four days out on the land, travelling to a couple different ethnic Even taboons and natural hot springs. A taboon is an Even term for reindeer herd. A small herd has around 500 reindeer, while a large herd can have over 3,000. The semi-nomadic Even people migrated down into the Kamchatka Peninsula several hundred years ago from the Sakha area of Siberia and are traditional reindeer herders. Conditions are very rustic, as we shift from everyman's cabins to local hunting cabins to homestays to the Even yurts, but this is part of the expedition in the Kamchatka wilderness. We will depart Esso in the morning by bus for Petropavlovsk, heading back down the way we came up. Concluding dinner in Petropavlovsk. Departures from Petropavlovsk-Kamchatsky. No scheduled activities today. Check-out time from our hotel is 10am. Blues and purples cover the sky as the sun sets over the city of Petropavlovsk-Kamchatsky. A hunter steps out of a cabin while enjoying his morning tea to observe a cat that has found itself on the roof. A sled pulled by a snowmobile cuts through the tundra in central Kamchatka. A dog waits near one of Kamchatka's many natural hot springs, while children play in the water. Reindeer herders along with some members from our Russian team relax in the winter yurt. Reindeer peek up from munching on grasses, aware and cautious of our presence.